What are the minimum requirements to commute comfortably through the winter? What needs to change on my bike? I have an 80's Schwinn Traveler single speed conversion. What needs to change with my clothing? I just wear regular street clothes now. I'm looking for the minimum requirements to commute comfortably through the winter. I am open to modifying my summer bike but not if it is likely to get ruined. I am open to buying a "beater" specifically for winter. I can bring my bike inside at home, but not at work. I'm in NYC. The bike doesn't matter that much, except when there's snow or ice on the roads. What you need most is the right clothing. It needs to be well-adapted to cycling (not loose or apt to get caught in the chain), layered so you can take off pieces BEFORE you get too warm, with wind-resistant and rain-resistant layers. Your shoes need to be somehow protected from wet spray, with rubber booties or such. Wet feet can get VERY cold. Lots of opinions on gloves -- you should probably have several pair, from warm "ski gloves" for really cold days to lighter-weight gloves for most days. "Glove liners" are a good idea -- you can use them alone (under regular cycling gloves) on warmer days, and they come in handy when you need to work on the bike in cold weather since you can work reasonably well with them on. 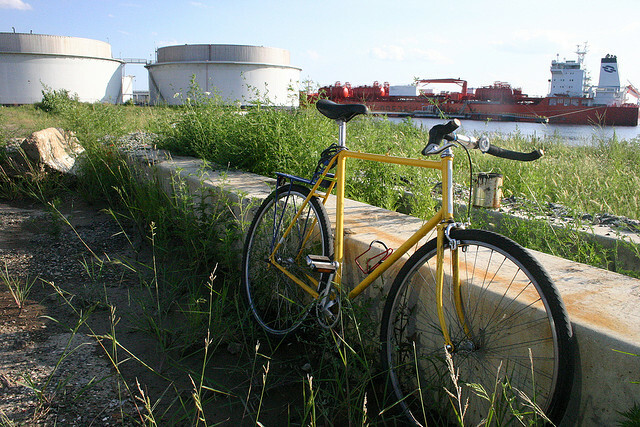 For the bike, any bike will work for plain rain or cold (though fenders are nice in the rain). For riding in actual snow (where the roads have not been cleared) you want a substantial tread, and possibly lugged "mountain" tires. For any sort of ice you MUST have studded tires -- riding on ice without studded tires is suicide. I don't feel that commuting is apt to "ruin" a bike, but you probably wouldn't want to subject a $6000 bike to the bad weather, road salt, being parked outside at the other end, etc. And if you do want to ride in the snow and don't already have a bike suited to knobby tires, it does make sense to purchase a modest "mountain" bike. Added: Forgot to mention the head. I always wear a helmet, making a bulky hat impractical. At one time I had a "helmet liner" (probably purchased from Performance or Nashbar) that was a sort of diamond-shaped piece of blue polypro fabric with loops to fit the helmet straps. This worked well -- kept the ears warm in fairly cold weather, which is the main challenge -- but I lost it and never found a replacement. I've tried several balaclavas and face masks but never found one that would fit comfortably, without either obscuring vision or interfering with breathing. My experience with riding 12 years through the winter in Toronto is that your bike is going to get ruined. Find a source for reasonable to cheap better mountain bikes and be ready to discard them after 2 or 3 winters at most. I found a couple of things helpful. Boots: Canadian Tire (sort of a car/tools/stuff store) sold these hunting boots that were thick rubber, with insulated insert, rated good down to -40C and -70C, depending on the model. I wore them down to -35C and my feet stayed nice and warm. The ankles articulated surprisingly well, so biking in them was pretty easy. Also I wear a size 13, so when I lost balance in the snow and put my feet down, I had huge platforms to offer balance for the bike. Pants: I do not know if it is me, but every bike I have owned sprays off the back wheel and fenders, while they help are not perfect. I started wearing ski pants, and that worked pretty well. Or else waterproof over pants with the appropriate (for the days temp) undergarments for warmth. Gloves: Like boots, keeping extremities warm is critical. There are tons of awesome gloves available. Get a warm waterproof pair. I am actually living in the NYC region now (NJ, other side of the GW) and I am too chicken to try the hill from the GW on the way home once the road is wet. That is too steep and long to do in my mind. So I would say weather here is not too extreme, more wet than really cold. My wife bought me this nice heavy winter coat (not for biking, rather for wearing to work etc) that I have worn 3 times in 5 years now. But I may be odd that way, not getting all that cold. For bike riding I used a MEC (Mountain Equipment Coop, Canadian store, sort of like REI and EMS) jacket that was windproof on the front, fleece on the back. I would pump out steam in cold weather, when I stopped at a light. Strange site to see. For the temperature range you're looking it, you're going to need reasonable, but not too over-the-top gear. Layers are the key, you'll get to grips with what works for you, but if you work with layers you can add and take away without too much trouble (particularly true if the morning and evening journeys are going to be different). Some good advice in the other answers about gloves, liners are key, but don't be afraid to go heavy early, there are few more uncomfortable feelings than numb fingers. One of those, though, is numb toes. Heavy duty shoes are very important - it's worse if you use cleats, because the clip is a great way for cold air to get into the foot area. Overshoes can work, especially neoprene/wetsuit ones, but layers are the answer here too. Start with thin socks. Mudguards or fenders are pretty crucial too if you're going to be going through rain, puddles, slush or similar. They won't stop everything, but they'll make like a lot more comfortable for your bottom and lower back and lower legs. Take a look at your bike, too. Perhaps a new pair of tyres with a little more grip and maybe the next width up - chunkier tyres, run at a slightly lower pressure, offer a more stable ride on uncertain surfaces. Also consider new brake pads with a wet weather compound to assist the braking. If you're commuting, will you have someone to dry your gear during the day? Having to put on wet, cold clothes to cycle home is never going to make you happy. I actually have a schwinn traveler converted to single-speed as my beater. Although the tubing is heavy, it appears hold up marvelously against corrosion. That makes a very good beater. I'd make the schwinn your beater! Really, the only thing you might want for winter is fatter tires and fenders. I put 45mm tires on mine. 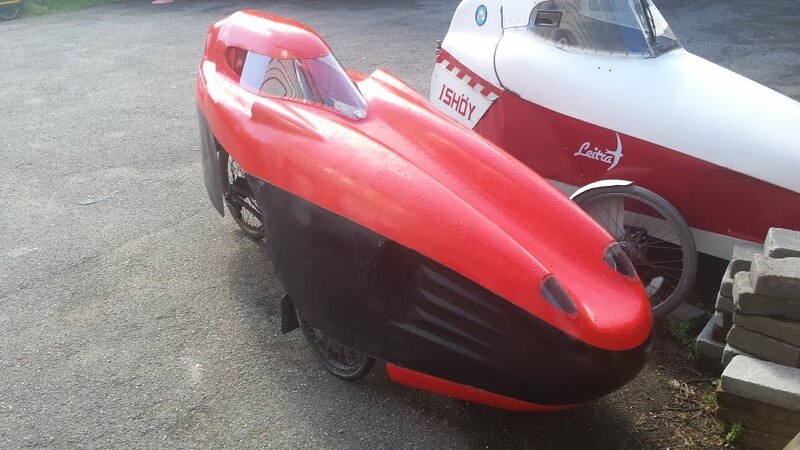 My winter commute tends to be in a well protected velomobile, so I often ride in a light pullover and jeans, socks, and my cycling shoes - and no other layers - in near-freezing temperatures. The inside of the velomobile cabin warms up nicely after the first kilometer. The salt on the road can be quite bad for your bike. You should try to wash it off after every ride. Going quickly over it with a wet cloth and more intense cleaning on weekends or such will prevent rust on your bike. I find that, cycling in winter, I can just wear regular (winter or autumn) clothes: except that I have to take my winter coat off, because it would be too hot. Also, I need warm gloves (because, unlike the rest of me when I'm cycling, my hands are gripping the cold bike in the breeze for the whole ride and doing nothing). My toes get cold too: e.g. because my cycling shoes are extremely ventilated (my socks get soaked when it rains, for that reason). To keep my toes warm, maybe two pairs of socks instead of one. I wear long pants when it's sub-freezing, or shorts (cotton street shorts, e.g. cargo shorts) when it's above about +5C. I have a variety of long- and short-sleeved shirts and jerseys (some with a zip), and a wind-proof Gore-Tex anorak, for when it's raining (above freezing). I find I don't want a wind-proof (I wear a shirt and jersey instead), unless it's raining or sub-zero. Having a pannier is useful for spare clothes: e.g. a rain coat if it might rain, ski gloves if it might go sub-zero, an extra shirt, etc. This is especially useful for commuting: where you have to be equipped for two rides at least eight hours apart, during which the weather and the time of day have changed. Coming home on Friday (no snow or anything) it was around 0C / 32F, with an intermittent 20mph / 30kph wind. I was wearing cycling shoes, cycling-specific full-length jeans, a thin sport shirt, a zip-up thin woolen jersey with the zip partially down and the sleeves pushed up, and gloves. At the end of my hour-long commute, a group of pedestrians (all wearing coats) asked if I wasn't cold: but I was hot. When I got home I was still warm (slightly sweating). But although the inside of me was warm and pumped, the outside of my skin was cold (even under my shirt). Cycling can let you burn quite a lot of calories. Also my feet were numbing by the end, and thank goodness for warm-enough (but not too warm) gloves. I'm trying some Sugoi Firewall GT cycling gloves, which have a built-in lining, and don't get too hot. I think I'll use warmer gloves, and a wind-proof shell, and do something about my feet, when it gets colder (below freezing). Your commute is 4.5 miles, so 7 km. I cycle that in 20 or 25 minutes (to give you an estimate of how hot I'm running). If the road surface gets treacherous (e.g. snowy) then you want to be dressed more warmly, because you dare not (for safety) cycle so fast, and therefore can't generate as much body heat (mitigated slightly by there being less wind at lower speeds). Not the answer you're looking for? Browse other questions tagged commuter winter snow ice or ask your own question. What's in a good all purpose city commuting winter tire? What special measures do I have to take to commute in frigid temperatures? What type of brakes is least subject to failure in the winter? What do you bring in your winter pack? Will my drivetrain freeze if left outside in the winter? Are drop bars suitable for winter commuting? Am I better off buying a new bike, or upgrading my old bike?